(Al Hartmann | Tribune file photo) Some of the 3,359 students make their way to class at Granger High School Aug. 22, 2016. The school is nearly new and only built for 2,800. Utah's teacher shortage is forcing schools to begin the school year with packed classrooms, some with substitutes at the head of the room. But Utah's school board hopes that will change under a new rule that allows schools to hire teachers without experience. Utah lawmakers and members of a ballot campaign to hike education spending through tax increases publicly disclosed on Monday they’re considering replacing an initiative with a plan passed out of the Legislature. The possible compromise would would lead to about $375 million more in annual funding for schools after five years by freezing a statewide property tax rate and asking voters to approve a 10-cent per gallon gas tax hike. The work behind closed doors has held up the budgeting process while a broader group of lawmakers now considers working alongside the campaign that itself sought to raise school spending by $715 million. 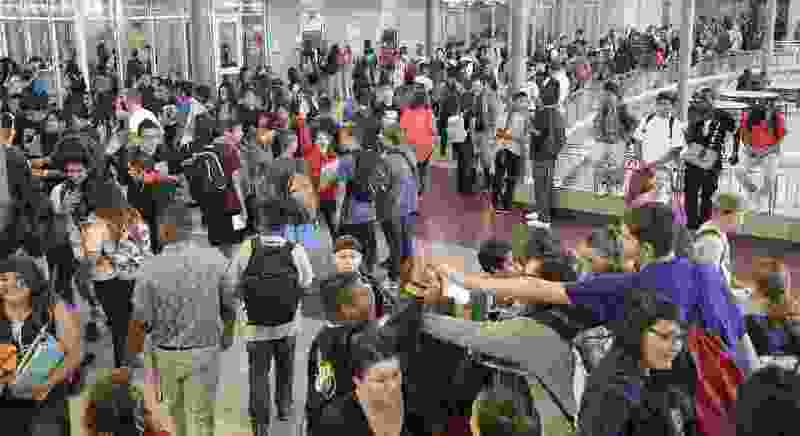 “We recognize it is late in the session to accomplish this,” said Austin Cox, a spokesman for the Our Schools Now campaign. “However, over the last several months we have collected more than 150,000 signatures from Utahns who believe this is the year to improve Utah’s stagnant per-student investment. 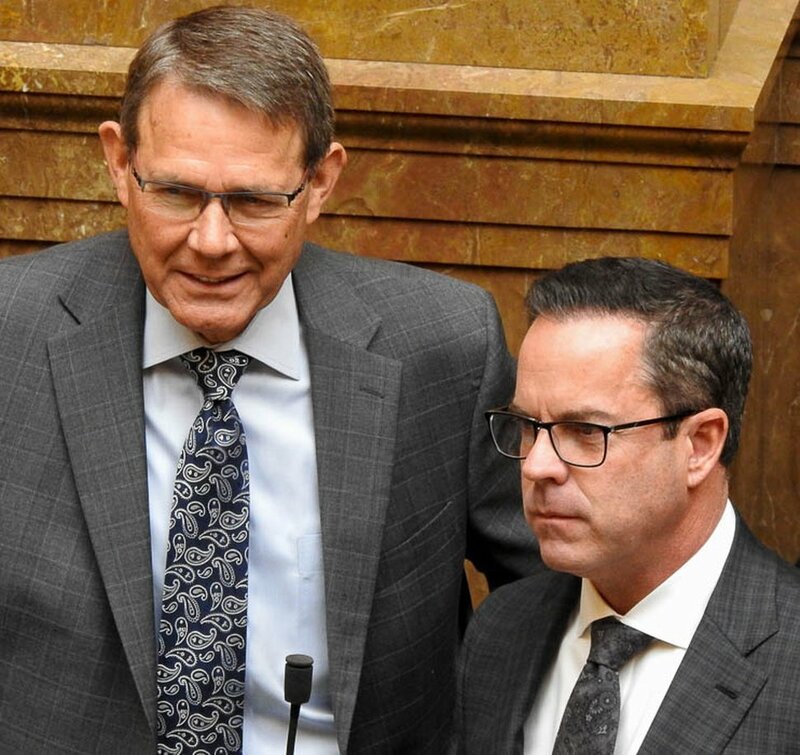 In addition to the possible increased spending through the gas tax hike and property tax freeze, Cox said the agreement includes a commitment by lawmakers to significantly fund education this year from the more than half-billion dollars Utah has from a booming economy. Utah lawmakers are eyeing a $190 million boost in spending for public schools and hundreds of millions of dollars for other state programs, according to draft budgets released Monday. But much of the school funding — $124 million — is only loosely committed as lawmakers continued to negotiate a tax increase package with Our Schools Now. (Trent Nelson | Tribune file photo) Rep. Bradley G. Last, R-Hurricane, and Rep. Brad R. Wilson, R-Kaysville, as seen on the Utah House floor on Tuesday January 30, 2018. Last said lawmakers’ current thinking is to spend roughly $90 million on an increase to per-student spending, with the remaining $33 million to used to equalize funding among Utah’s school districts. Beyond the as-yet-unassigned $124 million, lawmakers are also looking at maintaining a surplus in the state’s Education Fund by not spending all the available funds in it. Because that money is unspent state revenue, it does not appear in budget documents, making it difficult to identify the exact dollar figure that is being held back. Sen. Jerry Stevenson, R-Layton, said the idea to hold some education cash in reserve was proposed by Senate President Wayne Niederhauser, R-Sandy, to cushion against a potential downturn in the economy. (Rick Egan | Tribune file photo) Sen. Jerry Stevenson, R-Layton, as seen during a Friday, March 2, 2018, committee hearing. If voters agreed to hike the gas tax, it would free up General Fund dollars that now subsidize transportation. That money could then be directed toward schools. Sen. Stuart Adams, R-Layton, confirmed the groups are looking at asking voters this November to confirm a 10-cent per gallon gas tax hike. Utahns currently pay the state 29.4 cents per gallon of gas and 18.4 cents per gallon to the federal government. The state’s tax would be among the highest with a 10-cent increase. In total, a compromise would involve about $300 million more in annual education funding, Adams said. The Our Schools Now campaign would drop its initiative if lawmakers approve the proposal, he said. Several members of the education community declined to comment on the Legislature’s draft budget Monday, but privately expressed reservations over the funding totals for public schools. Niederhauser compared the plan to withhold funding to a similar decision made in 2007 on the eve of the Great Recession. He said it’s unlikely lawmakers will hold back $100 million, as they did in 2007, but that $50 million or $25 million would be wise to protect against future downturns. Monday’s budget also includes $1.6 million to bring the salaries and benefits of Utah’s college and university employees in line with other state employees, and $3.5 million to fund growth in higher education scholarships. And $18 million is proposed to address the growth in enrollment in higher education, and to expand capacity in programs deemed to be critical to Utah’s workforce needs. “We feel like they’re making a real effort to treat higher education fairly in addressing our top priorities,” said David Buhler, Utah’s commissioner of higher education. • $8.5 million for repairs to 2002 Olympics venues to help Utah bid for another winter games. • $1.72 million in ongoing money to lower radioactive waste inspection fees by EnergySolutions, the single-largest campaign donor to legislators. Supporters say the company needs the fee break to be more competitive with similar out-of-state companies who pay lower taxes and fees. • $700,000 to pay for SB171, a bill to allow the Legislature to defend laws it writes when it chooses — instead of depending on the state attorney general. The attorney general’s office, meanwhile, says the measure may be unconstitutional by violating separation of powers. • $10.5 million for Operation Rio Grande, the stepped-up law enforcement efforts focused on areas of downtown Salt Lake City frequented by the homeless. • Nearly $2.9 million to fund HB41, which will help ensure that suicide prevention hotlines are staffed around the clock — after some incidents where teens killed themselves after unsuccessfully trying to use them. • About $540,000 to fund HB12, a bill to providing low-income women with long-acting birth control, such as intrauterine devices (IUDs). • Money benefiting several groups that hosted family events for lawmakers during this legislative session, including $2 million for the Loveland Living Planet Aquarium; $225,000 for the Center Point Legacy Theater; and $100,000 for the Hale Center Theater. • While the Legislature this year voted to remove a statue of TV inventor Philo T. Farnsworth in the U.S. Capitol to be replaced by one of Martha Hughes Cannon, the nation’s first woman senator, budget writers are giving $10,000 to a Philo Farnsworth museum. • Other money for arts groups and events includes $1 million for the Sundance Film Festival; $1 million for the 150th anniversary celebration of completion of the transcontinental railroad; $200,000 for the Days of ’47 Rodeo; $250,000 for the Hill Air Force Base Air Show; and $100,000 for Provo’s America’s Freedom Festival.